Which is better to drive behaviour change... evidence or emotion? 'Evidence or emotion? That is the question’. This is how Shakespeare would sum up the zeitgeist of our age when thinking about decision making and behaviour change. The basis for our decision making is often seen as one or the other. Do we use our emotions, or do we use the available evidence to guide our decision making and behaviours? This supposed dichotomy between evidence and emotion in decision making is worth further examination, starting with understanding what we mean by both terms, and then exploring the role each has to play in decision making, including when each is most useful in driving behaviour change. What do we mean by 'evidence'? ‘Evidence’ is best defined as the available facts and information relating to the topic. These facts and information can be further defined as ‘empirical evidence’ which is information and facts gained by observation and use of external senses. What do we mean by 'emotion'? While it may seem complicated to define such an abstract phenomenon as ‘emotion’, a widely held definition is that “an emotion is a complex psychological state that involves three distinct components: a subjective experience, a physiological response and a behavioural or expressive response.” Further exploration of ‘emotions’ can be found in our Knowledge Hub piece on using research methods to understand emotional decision making. Expanding on this definition, the theory of emotions developed by psychologist Robert Plutchik states that there are eight basic emotions: fear, anger, sadness, joy, disgust, surprise, trust and anticipation. What role do 'evidence' and 'emotion' have to play in driving behaviour change? So, now we have an understanding of ‘evidence’ and ‘emotion’, let’s explore the role each has to play in decision making and when each is most useful in driving behaviour change. Using a few examples, I would suggest that both drive different types of behaviour change and can be used together to most effectively influence decision making and behaviour change in relation to social issues. Evidence is useful in driving behaviour change when it is seeking to influence decision-making at scale, such as political, strategic and legal change at national and global levels. Emotion is useful in driving behaviour change when it is seeking to influence decision-making on an individual level through creating a connection and attachment between each person to the social issue. We’ve provided some examples of social issues where changes have been driven by evidence (for the policy and legal decision making leading to change) and emotion (for individual decision making leading to change) to illustrate how both can be used to address the same social issue, but in different ways. In the 1950s, researchers began to increasingly gather together and generate a range of evidence to show the links between smoking and lung cancer to change national policy and legislation regarding smoking. This culminated in a large-scale longitudinal study undertaken by Richard Doll and Bradford Hill, whose report was published in 1954. This report, and other research, persuaded the UK government at the time to generate an awareness raising campaign to highlight the dangers of smoking via local health authorities, with the then Parliamentary Secretary to the Ministry of Health saying that “it is right that everyone knows the risks involved”. It was assumed that knowing the evidence would be enough for people to make their own informed decisions about smoking in their own lives (and change their behaviours). However, while the evidence led to further substantial changes in laws about smoking, such as the ‘smoking ban’ making it illegal to smoke in enclosed spaces which came into force in July 2007 in England, it has been proven that evidence alone, and a spate of control measures, is not enough to drive behaviour change at the individual level. Campaigns aiming to drive behaviour changes in individuals most often have to appeal to our emotions. 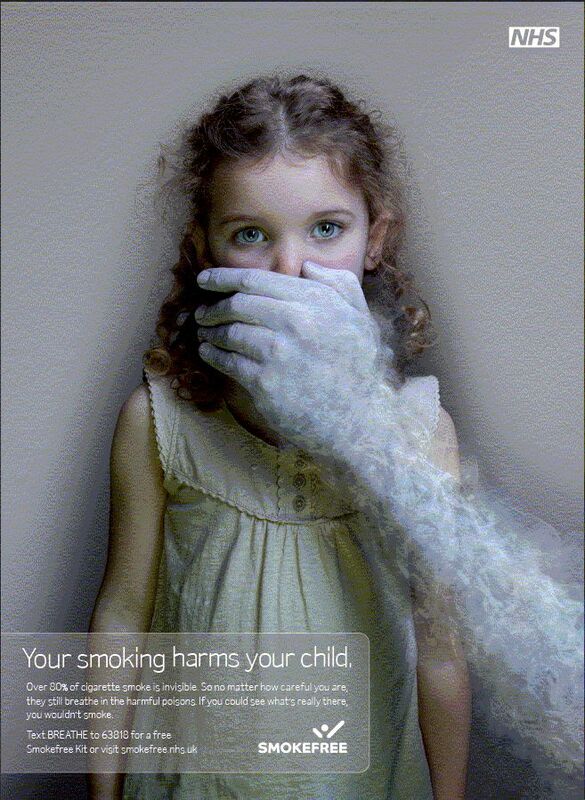 A good example is the use of ‘shock tactics’, such as the shocking images with health warnings on tobacco products which came into force across England in 2008. When a campaign aims to influence individual behaviour change related to smoking, campaigns that use emotions tend to resonate more with the audience. For example, the NHS Smoke Free materials visualise the effects of smoking on children elicited shock, and to a degree, guilt, to drive decision making to stop smoking or at least stop smoking near children. We recently worked on creating a campaign aimed at encouraging people to stop smoking, and we used emotional angles to highlight the effects and impacts on children with great success. You can find out more here. Although the link between human emissions of greenhouse gases and changes in the climate have been put forward since the late 19th century, it has only been since the 1960s that research has really been gathering pace to generate evidence to demonstrate this link. The role of evidence in influencing national and global decision making and behaviour change in relation to climate change was made clear with the creation of the Intergovernmental Panel on Climate Change (IPCC), set up in 1988, with the aim of providing the world with an objective, scientific view of climate change. Indeed, a number of political and legislative changes related to climate change, such as the Kyoto Protocol in 1997 and the Paris Agreement in 2016, have come into force informed by available evidence. Again, while the available evidence has shifted decision-making and behaviour change at policy, governmental and legislative levels, organisations that aim to shift decision making of individuals to take action to stop or limit climate change do so by tapping into our emotions. One of the best examples in recent years is the life-size installation of giant whale made entirely out of plastic created by Greenpeace Philippines. By using plastic waste to visually show the effects of this in our ocean as a dead whale, beached on the edge of the sea, they effectively highlighted the damaging effects of plastic in our oceans. Looking at this image is intended to generate a range of emotions, not least sadness and shock about the deaths caused, to bring the issue to people’s minds in a way that they can connect with it. Another example is a video from the conversation group Sea Legacy showing a starving polar bear searching and scavenging for food. The photographer, Paul Nicklen, who posted the images online, wanted to tell the story of the polar bear to help convey the message about how climate change effects animals. In his own words: “When scientists say bears are going extinct, I want people to realise what it looks like. Bears are going to starve.” Our emotional responses, such as shock, sadness and anger, when seeing a starving bear engage us and resonate more to make us sit up and take notice of the impacts of changes in our climate far more than simply hearing that; ‘unless you change your use of plastic, polar bears are going to go extinct’. The potential power of our emotions in decision making is huge. Companies are even trying to get direct access and insight into our dominant emotions and emotional states to influence our decision making and behaviours. Don’t believe me? Simply look to the tactics employed last year by Cambridge Analytica to gather deeper insights into our emotions and psyche through a personality quiz for use in targeting political campaigning. To effect a change in behaviours related to social issues, there is a place for both evidence and emotion. Both have an important role but, as we have seen, they play different roles in driving behaviour change. If we want to make behaviour change happen at population scale through policy, legislation or strategy, evidence is key. If we want to make behaviour change happen at an individual level, emotion is key to generate the personal response, connection and agency within us to change behaviour, because we make decisions based on our emotions more than we’d care to admit.